Channel selector for individual control of multiple cameras. Interchangeable connectors for different camera models. Receiver takes a CR2 lithium battery; transmitter takes CR2032 battery. Batteries included. Timed sequence fully programmable including self-timer, delay, interval timer,exposure count and exposure length setting. 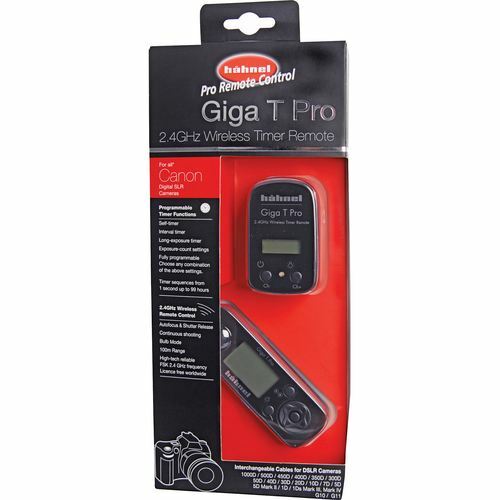 Shutter release button with autofocus, single & continuous shooting, bulb modeand self timer. 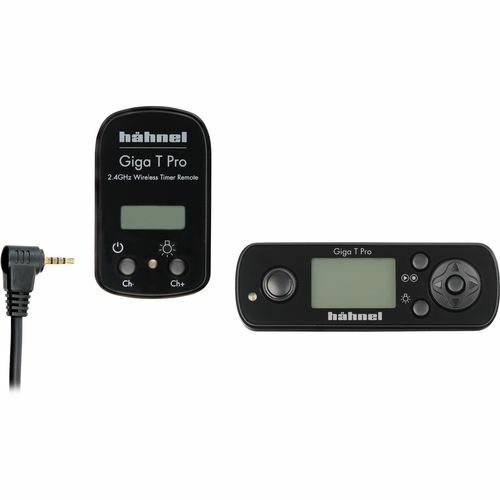 The Giga T Pro II has a Transmitter On/Off button to save battery power. It has two timing loops, one embedded in the other. This allows you to repeat the original timed program as many times as required. You can use the original program feature to create a timed 10-minute series of astral shots. You can then set this program to repeat at hourly intervals. You can set up a basic program which allows you to set up a timed shooting sequence, defining the delay, number of shots, interval shots and so on. 100 meter range for wireless control. Can also be used as cable shutter release. Through-wall transmission. LCD display with back lighting. High-tech, reliable wireless FSK 2.4GHz frequency, license free transmission worldwide.